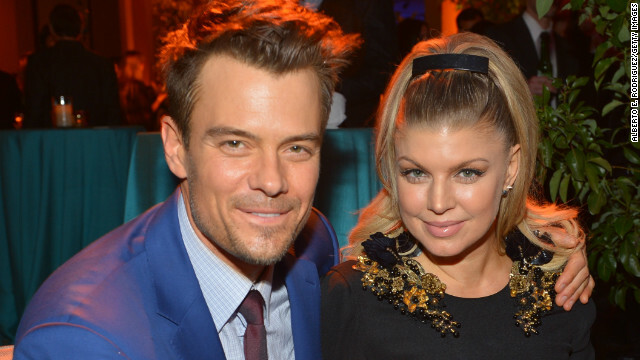 Before she'll be called "Mom," pregnant singer Fergie is undergoing another name change. Although the Black Eyed Peas star has been known professionally as Fergie, fans know that she was born Stacy Ann Ferguson. It's a moniker that dates all the way back to her "Kids Incorporated" and Wild Orchid days, when she was a member of that '90s girl group. Now, however, Fergie wants to make her stage name permanent. According to reports, the 38-year-old has filed documents in a Los Angeles County courthouse to legally be known as Fergie Duhamel. That way, she'll also share the last name of her husband, actor Josh Duhamel. The couple, who've been married for four years, are expecting their first child this year. was degraded by your girlfriend. Get into the que and will wait...thank you boys. I dunno – a "Fergie Duhamel" sounds like something you'd ask for at a Texas brothel that involves having a prairie dog forced into places a that prairie dog was never intended to go. ...and only you would know that! In Montana we call that a "furry Duhamel"
Carl... finally something worth a good laugh. Well played. I wanna change my name to poop....just...poop. Why in hell she decided to adopt the name of Duchess of York Sarah (Ferguson) is beyond me. I really don't get it. Such an ugly name anyway. But she wants to be a copy cat and a bimbo, that is her right. Fergie is the nickname for Ferguson, her real last name! She didn't take it from the former royal. I knew a woman who's last name was Ferguson, and everyone who knew her called her Fergie. Her last name is Ferguson, you dunce. Did you even read the article? no actually we know everything about her. I think they are the cutes couple, you never hear any dirt about them, they just keep living their lives like normal people which will be great for the baby. I then so much, keep up to good work. I like it. They've been together for a while now. And in a more traditional way, she is taking his last name, a sign of their affection for one another. She's known as Fergie, so changing the first name, officially makes sense too. These are role models to those who take relationships seriously. And next month she will change her name to T-Ferg. Then the artist formerly known as Ferg. Then Ringo for some unknown reason. Her child will just call her mommy-licious. Wait, she is married to that loser from that cancelled show, about that place that people only go to because states are cracking down on online gambling. Yeah, way to pick a winner and put him in your name, Fergs. A famous wife taking the husband's last name...how novel. I still don't know much about her, but, I liked the character he played on AMC. What's wrong w/the name Stacy Duhamel, anyways? She can still use Fergie for her stage name. I think they are a really cute couple. Probably, everyone calls her Fergie, so I guess I can see the change. Nobody's business but hers, I guess. At least she's not changing it to Moon Rocket, or something crazy like that. I've seen 40 year old catcher mitts that look less weathered than Fergie. ... and have seen fewer balls smacked into them. Thought she was going to change it to "Snoop Lioness" or something stupid like that. Yeah, because Fergie Duhamel isn't stupid enough. Good for her to add her husband's surname as her own. That is the common sense thing to do instead of all the posturing some people do with the hyphens and so forth. How much easier for handling their affairs and for their child and hopefully children. Good for you Fergie!!! Why? She chose to give up her name and that's great for her, but what's wrong with a woman keeping her name? I did when I was married and never had a problem, and I'm far from the only woman who doesn't want to subject herself to the hassle of changing all of her identification because of marriage. Is hyphenating a name that difficult??? Its not that different than saying your full name. Life is easy enough for most people. Good for her. Wonder how cute her baby will be. You'd be surprised where they have been...truly surprised, most people would never know ... I mean like Janine and serfina but that's about it. I you build it, he will come. who knows...they appear connected...I hope so they are so many couples out there with so many horrible issues. all the best too fergie and her man. Healthy relationship...this is a healthy couple. All the best. They sure are a dumb looking couple. They look like embiciles. Only an imbecile doesn't know how to spell ' imbecile '. You are probably related to Sarah Palin. That sounds dumb. How will we know who she is if she changes her name ?